We all know that home insurance can provide you with the money you need to repair your home and/or belongings. But did you know that some home insurance policies also provide coverage for accidents away from the home, dog bites, and more? Before you go out of your way to repair any damage or pay with your money, you should check to see if the damage is covered by your home insurance policy. Keep in mind that every home insurance policy is different, and therefore every item on this list may not be covered by your personal home insurance policy. Here are some surprising things that may be covered by your home insurance policy. Accidents that occur away from the home that don’t involve any vehicles are generally covered by your homeowner’s insurance. For instance, if you accidentally injure someone else while playing sports, you can file a liability claim through your homeowners policy. Did you know that over 30% of homeowners claims are for dog bites? The majority of home insurance policies provide around $100,000 – $300,000 of liability coverage for injuries caused by a pet, and addition, provides some medical coverage for the injured party. Have any pets? Check and see if your home insurance policy provides coverage for pet related injuries. Do you or a child reside in a dorm room or on campus housing at their university? If so, can file a claim through you homeowners policy in the case of theft and items stolen from the dorm room. Even though your child (or you) left and took their belongs with them to college, they still get to take advantage of your off-premises personal property coverage as long as they are full-time students and campus residents under the age of 26. If the student lives in off-campus housing they may need to get a renter’s insurance policy for this same coverage. This varies between policies, so be sure to check your own policy to see what coverage it offers. In general, the fire department usually sends you a bill after they are called to your house. However, you may not have to pay for it- it may be covered by your homeowners policy depending on the reason. Be sure to check your policy to see if you are covered! Many home insurance policies consider gravestones to be personal property regardless of whether its kept on your policy or if you bought it as long as you are the primary caretaker. If your family member’s gravestone or headstone is vandalized, call your agent and see if you’re covered. Identity theft is a common and unfortunate event that could happen to anyone. Did you know that some home insurance policies will help out with expenses in the case that your identity is stolen? Some general expenses covered include lawyer fees, lost wages, and any fees charged for reapplying for loans if you were rejected based on inaccurate credit bureau information. Did you know that libel and slander are covered by homeowners liability insurance? If your teenager slanders one of their peers on Facebook or some other social media network, the liability portion of your homeowners policy kicks in to help cover any costs in case a lawsuit is filed against your child. It is not very uncommon for a city to pass a new ordinance that forces you to make some sort of costly property change or improvement to bring it up to code. If this happens in your city, your homeowners insurance will probably cover the cost. Just keep an eye out for “ordinance coverage” in your policy. Although this is a very uncommon situation, there still is a chance that your house may be hit by anything from outer space such as a meteorite, space debris, satellite, or bits and pieces of airplanes flying overhead. In most polices, all of these items and more are covered under a “falling objects clause” that extends its coverage past houses. It also covers damage to your automobile or vehicle and pays out to your beneficiaries through your life insurance policy in the case that the falling items cause a death. Was there a riot near your house that caused damage to your personal items? Or a terrorist attack that caused fires or explosions to destroy your personal property? Chances are your personal home insurance policy has you covered. This also may extend to include damages to a car or other vehicle. Keep in mind that many policies have specific exclusions with regards to terrorist activity, including times of declared war. Have you ever had an extended power outage in your home only to be disappointed when you open your fridge shortly after and find everything to be spoiled? IF a power outage causes your freezer to thaw and spoil food or causes groceries to spoil in your fridge your policy may actually cover it. Many policies will cover spoiled groceries up to $500 in the case of a power outage. 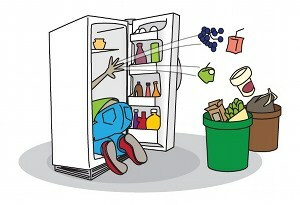 The spoiled food coverage does not apply if it turns out your refrigerator was old or broken. This may sound a little silly to a lot of us, but if you live near a ranch or a farm, cows pose a threat of damaging your property. If they are your cows, your insurance company may offer some coverage to your damaged property. If the cows belong to your neighbor or someone else, it’s more likely that their insurance company will be the one to pay for the damage. In the case of natural disasters you generally have to buy a special insurance such as earthquake insurance or flood insurance through the National Flood Insurance Program. However, if you live in proximity to a volcano your homeowners policy generally will cover damage from volcanic eruptions without requiring any special add-ons. How to Use Technology to Help Keep Your Home Claims-Free What should you do if you are injured at work?